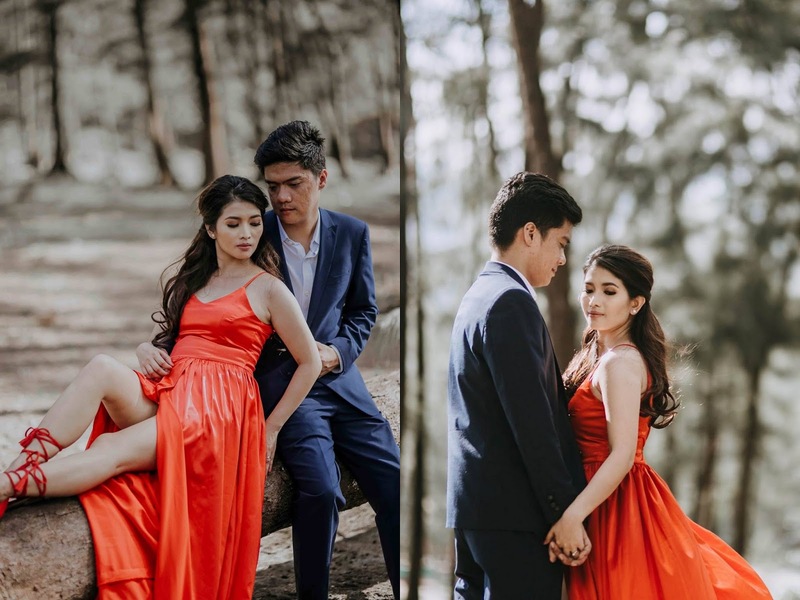 Engagement shoots are becoming popular nowadays not just in the Philippines but also abroad. Of course, it's not required and not all soon-to-be married couples will do it. However, as much as we want to avoid the norms, Radney and I can't help but be excited to be the star of our very own pictorial especially when we see celebrities and friends having their own e-sessions. We've been following several photographers and videographers in social networking sites such as Facebook and Instagram, we were so amazed how non-celebrities can project and look glamorous in photos. We were really excited, nervous and curious at the same time. Anyway, it's just once in a lifetime and like others, we want to keep wonderful photos of us together before entering the next chapter of our lives. Obviously, Radney and I love to travel most of the time hence I created this blog. Here in the Philippines, we love to de-stress with nature. So our idea of pictorial is outdoors, we want our photos with nature as background. We had a hard time finalizing the location. My top 3 personal choices are: Mt. Pinatubo (Zambales), Minalungao National Park (Nueva Ecija) and Tinipak River (Rizal). I kept convincing Radney with Mt. Pinatubo, I've hiked there once and I find its crater lake so scenic and breathtakingly beautiful. Even the endless volcanic ash where 4x4 jeeps pass before going up for sure will give an outstanding picture. Whew! But I wasn't cute enough to convince my fiancé, he rejected the idea. LOL! But in the end I realized that he's absolutely right because if we will push through with Pinatubo, it will be too stressful for us and the rest of the suppliers, hagardness to the max! There are no shortcuts getting to the volcano's crater lake and the shortest route will take 2 hours trek (unless we hire a helicopter which is so impossible for us!). And even the hair and makeup artists, I consulted them and they didn't like the idea too as they've already experienced it with previous client. With all their makeup kits and our stuffs (clothes, packed foods, etc. ), it will be exhausting for all of us plus we needed electricity for the airbrush machine. Radney also didn't agree with Tinipak and Minalungao. According to him, he really want a place that is as a total package, not just river but where seas, mountains and forest are present all in one location. 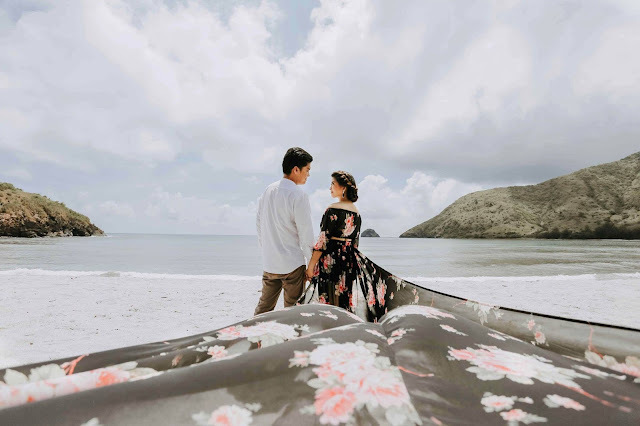 His suggestion is either Anawangin, Nagsasa or Talisayen Cove in Pundaquit, Zambales. 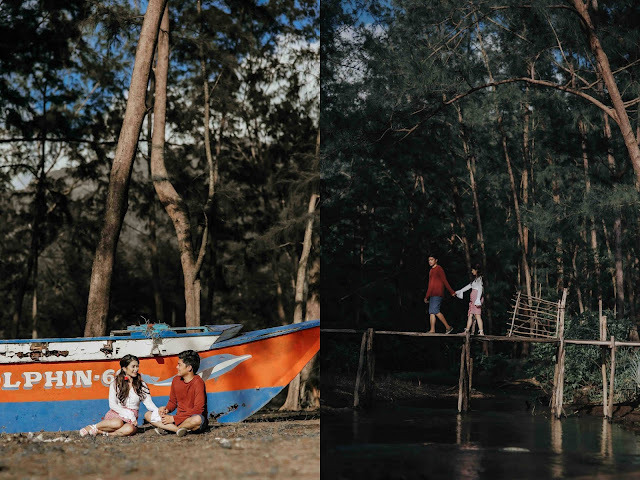 On the day of the shoot, we decided to go for Talisayen Cove, it is pretty much similar to Anawangin but is still fresh and not that popular yet as also suggested by the photographer. Unfortunately, due to some miscommunication with the boatman, we just found our boat docking in Anawangin instead and we had no choice since we arrived almost past lunch and transferring to another cove will be time consuming. Still, we were blessed with the perfect weather, it was a sunny Monday and only our group is present during the shoot. It was my third time in Anawangin but it was my first time to see it without the crowd. We really planned to have 4 sets of outfits, 2 long dresses and 2 casuals. Radney and I searched the malls, department stores and bazaars to look for the perfect clothes. It wasn't easy! Since we're not really good in terms of fashion, shopping became a burden for us. Still, he was able to find his clothes at the mall, shoutout to Uniqlo! For his formal wear, he rented a set from Gardini Fashion Center in QC. Based on this experience, I can conclude that it is easier for men to find their clothes but would be very critical on the part of girls. I wasn't able to find long dresses in those locations and gowns in malls are way too pricey! Not bad at all as I was able to buy one off-shoulder midi floral dress from SM Girl Teen's Wear (GTW) section, in small size! Probably, dieting works for me! :) For the rest of my outfits, Radney pitched the idea to have mine custom-made. I searched for pegs from google images/pinterest and have our friend seamstress create the dresses. I will list down below the cost of having my outfits custom-made. I've actually attempted to hire a popular professional stylist but she replied that they are already fully booked for the whole month of August and I've found another one which is cheaper but I don't like much the style. I don't accessorize much so I just bought earrings from SM Accessories to match the outfits. For the shoes, I purchased all of them online and have them delivered straight to our house in Bulacan. I will share all the details later below. 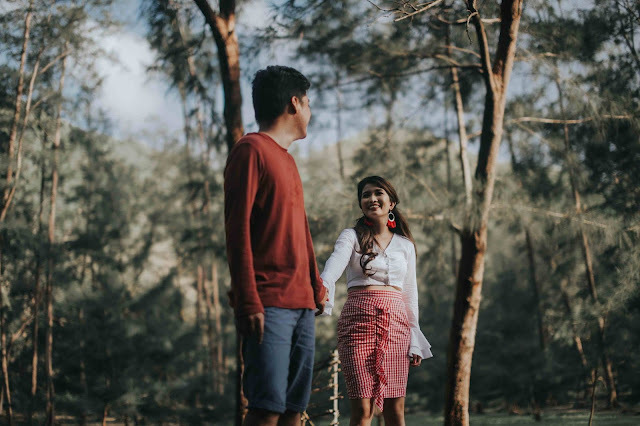 We opted not to use props like teepees, flower crowns, flower bouquets which is the usual styling used in engagement shoots. I'm a person who is not blessed with good skin and most of the time I'm not confident with mine. I'm also not knowledgeable with makeup. On a daily routine, I simply put on lipstick (always in coral to red shade) and baby powder in the morning, no retouch! I'm also not into foundations and BB creams. And whenever I feel oily, I like to wash my face with tap water making it too dry. Like other brides, I went to Themes and Motifs bridal fairs several times. I gathered all the makeup brochures and flyers to compare the hair and makeup package rates. There were too many choices but we were able to shortlist them by sticking to our budget. I think it was on my second visit that I made a trial make-up with FroilanErik Artistry. Froilan and Erik have the most eye-catching booth there and they're consistently joining the fair. I was happy with my trial look and it was my first time to have full makeup on using airbrush foundation! After the trial, I booked them right away without even trying other makeup artists because I already find their package rates affordable and they use quality and professional makeup brands. From prenup to wedding, they only use airbrush base not only for the bride and groom but also for the whole entourage. They were able to cover my flaws and blemishes and they were very good in shaping my eyebrows. Aside from their works, their bubbly personalities and professionalism attract me the most. For photographer, we're not looking for "sikat" with expensive packages. We're looking for a professional photographer that is affordable but has equal talent, an eye for aesthetics and good editing skills like the popular ones. Radney came across Peter del Rosario's portfolio and he was amazed with his works and experience. He is from Biñan, Laguna and had several collaborations with God's Grace Productions. He is also the owner of Lights and Flair Photography. We immediately scheduled for a meet-up. Maybe because he is of the same age bracket with me and Rad, we find him easy to talk with, after our discussions we booked him on the spot. As he is the main photographer, he is strictly implementing one event per day. He suggested some of his tie-up videographers and mentioned Roadtale. We looked at Roadtale's tying the knot films and same day edits on Vimeo and we were really drawn by his unique and non-traditional style in videography. We watched his works so many times. We liked the voice overs and his choice of background music for the videos. He is also using music/songs that are safe from copyright infringement. Like Peter, Gino Lopez of Roadtale is easy to talk with. I remember we scheduled our meet-up at Manila Hotel where his team will cover a debut then. We just had quick chat and there was no need for him to show us his samples because we've already watched all of it, so we booked him too during the meet-up. How much I spent for this look? Note: Shoes not shown in photos. We needed to submerge our feet in the water, thus, we had to go barefoot for the entire set. Note: We're also barefoot for this set since we were having bonfire by the beach. P.S. I'm sorry if I wasn't able to share the details for Radney's clothes, he may have discarded all the price tags but most of it you can find at Uniqlo. And although I spent much on clothes, it is still cheaper compared to hiring a professional stylist. At the end of the day, the clothes, shoes and accessories are all mine which I can re-use for future events. See full engagement portfolio HERE and our Tying The Knot Film HERE. Thanks for sharing these well managed preparations to be done at engagements. Will suggest to my friend planning to get engaged next month. Also seen many wedding venues and caterers in Seattle online for the most awaited party. Hope all the bookings are finalized soon. Hi! I am planning to have my prenup in Anawangin also but I can't find any contact number. 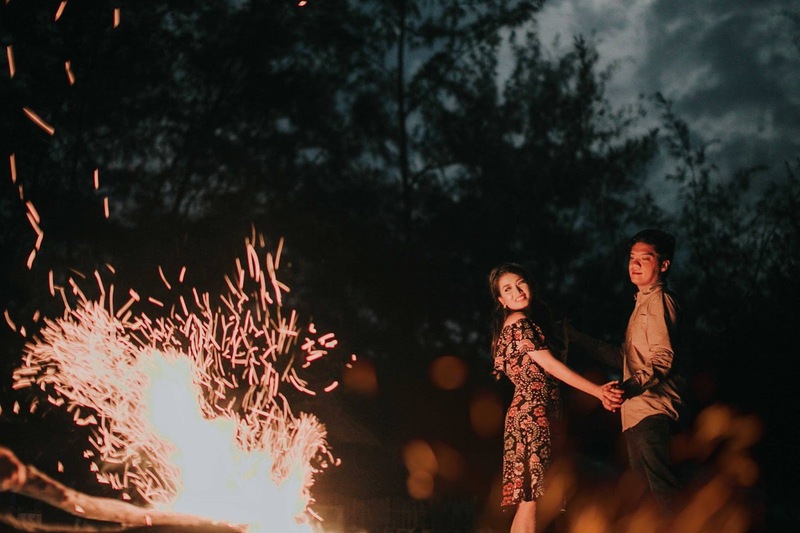 Since you have been there, how did you book the place for your prenup sesh? Thank you!